Corn Chowder Recipe Crock Pot Edition! This corn chowder recipe is simple and delicious. It doesn’t have any complications. You can put it in the crock pot in the morning and have hot chowder for dinner! Put all of the ingredients, except the reserved kielbasa, slurry and toppings, into the crock pot. Mix together and then, put the lid on it. Set the temp for the amount of time you would like. (4-6 hours on low and 8-10 hours on high) About an hour before serving, make and mix in your slurry. Right before you eat, crisp up your reserved kielbasa for an added level of deliciousness. Top as you would like and, if you would like, serve with crackers or a biscuit! It’s comforting, delicious and easy! Oh, it also reheats well and makes excellent leftovers! 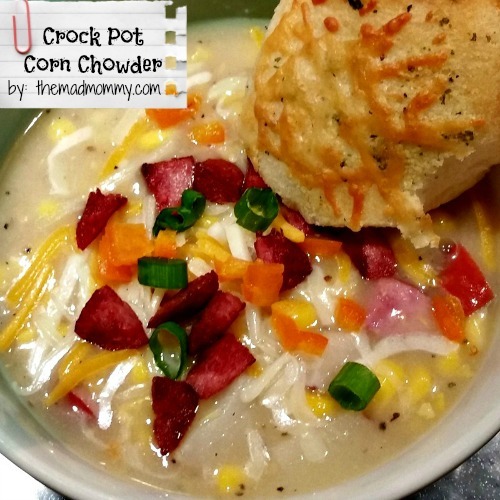 A Corn Chowder #recipe made easy with a #crockpot and The Mad Mommy! Do you like Corn Chowder? This looks delicious! I love to find new Crock-Pot recipes 🙂 Thanks for linking up and sharing this at Together on Tuesdays!!! This looks fantastically easy (and delicious too). Love me some kielbasa, but my kids won’t touch it! Good recipe though for the hubs and I! I have never had corn chowder and this recipe looks so good and easy! Maybe since it is corn my kids won’t be their normal picky selves! I want some now, I’m hungry! That picture looks really good, I have about half these ingredients so I want to add this to my menu this week. Pinning this! why have i never thought about adding kielbasa?! so trying this, love a good corn chowder and extra bonus that it’s a crock pot meal!! This looks delicious! I have never made corn chowder, and I love that this can be made in the crock pot! I don’t make enough ‘set-it-and-forget-it’ recipes, but the more I read about them the more I wish I did! I have also never made corn chowder. Is Kielbasa a standard ingredient for Corn Chowder or is it your addition. I only ask because I’m vegetarian and curious. The soup looks great, and is really easy to ‘vegetarianize’ which I like. Did you make the biscuit too? Everything looks delish! YUMMMYYY!!!!! 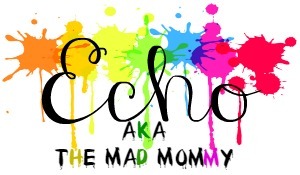 ECHO, what a wonderful treat this is! I love kielbasa and so does Des! And I love crockpots and I love chowder. So I think it’s safe to say I want some of this right now. Crock pots are making their way back in my kitchen, this recipe would be delicious! I have Pinterest board titled “Some Day I might use my Crockpot!” I think I’ll pin this to it. LOL. I have great hopes for my crock pot and I just end up not doing anything with it! Thanks for giving me hope though! Love this idea for slow cooker corn chowder. We were on a soup kick having it once a week during the winter, going to have to add this to our collection. Thanks for sharing with Small Victories Sunday Linkup. Pinning to our linkup board. That sounds really good! I love chowder, and anything in the crock pot is great. Thanks for sharing at On Display Thursday. I am pinning this! I love anything that involves throwing it in a crockpot…and chowder?! YUM!